What a better way to start the New Year as the Nollywood industry has been recording various nuptial tying in the past few weeks. The various marriages that have taken place in the Nigerian entertainment industry goes to show that true love still exist despite the various breakups recorded in the past. 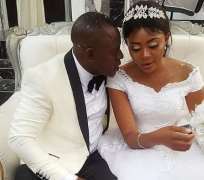 Joining the marriage family is popular movie marketer and producer, Crystal Touch productions, who had his church wedding recently. Crystal Touch productions just like some celebs, is one who loves keeping his private life off social media and he took many by surprise when he decided to walk down the aisle with his woman.